The war-torn world of the DC Comics Bombshells pits new combinations of heroines against unexpected threats at home, and finds Wonder Woman facing a deadly, dedicated enemy who strikes at the heart of her nature: the shape-shifting Clayface! Joined by teen heroines Donna Troy and Cassandra Sandsmark, Wonder Woman must wrestle with the dark spectre of internment camps imprisoning American citizens at home and the threat of xenophobic villains including a renegade military force called the Mud Pack. But even the two Wonder girls plus teen heroines Emily Sung, Yuki and Yuri Katsura, and the mysterious winged heroine called Dawnstar aren't enough to protect Diana from Clayface, whose powers affect the very clay that was an intrinsic part of Wonder Woman's origin! From writer Marguerite Bennett (Batgirl, DC Comics Bombshells) and astonishing artists including Marguerite Sauvage (Sensation Comics Featuring Wonder Woman), Marcelo Di Chiara (Teen Titans GO!) and Siya Oum (Lola XOXO) Comes Bombshells United Vol. 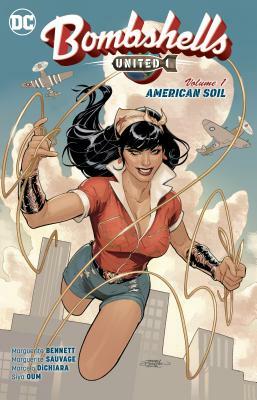 1: American Soil, bringing the incredibly popular DC Collectibles line to life in stories from Bombshells United #1-6! Marguerite Bennett is a comic book writer working for such major publishers as DC Comics, Marvel, Aftershock, BOOM! Studios, Rosy Press and more. She is best known for projects such as DC's BOMBSHELLS, A-FORCE, ANGELA: QUEEN OF HEL, RED SONJA and INSEXTS.